Consumer Product Safety Commission (CPSC) and Honeywell Consumer Products Inc. (HCP), of Southborough, Massachusetts, is voluntarily recalling about 450,000 moveable baseboard heaters. The heating element in these baseboard heaters can short-circuit and ignite combustible material under the heater, posing fire and burn hazards to consumers. CPSC and HCP have received 53 reports of these heaters short-circuiting, including two cases where the floor beneath the heater was damaged due to fire. The recalled HZ-514 HCP baseboard heaters are about 40 inches long, 8 inches tall, and 4 inches wide at their widest point. The white baseboard heaters have the name "Honeywell" printed on the front of the unit. The recalled heaters have: a six-digit date code beginning with "97" on a sticker on the back or the bottom of the unit, or a date code beginning with the digit "8" or "9" stamped on the flat metal prong of the electrical cord's plug, or a date code beginning with the digits "00" stamped on the flat metal prong of the electrical cord's plug and "TYPE I" or nothing stamped on the bottom of the unit. Consumers can contact HCP at (800) 311-4204 between 8:00 a.m. and 10:00 p.m. Eastern Standard Time Monday through Sunday or log on to the company's website at www.honeywell.com to determine whether their heater is part of the recall. Consumer Product Safety Commission (CPSC) and Applica Consumer Products Inc., of Miami Lakes, Florida, is voluntarily recalling about 2.1 million VersaToast™ wide-slot toasters. 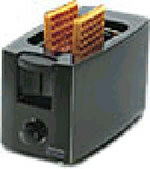 Applica made and sold these toasters under the Black & Decker® brand. The heating element in these toasters can continue to operate after use, posing a fire hazard. CPSC and Applica are aware of nine reports of fires associated with these toasters after a period of non-use, resulting in minor property damage to kitchen cabinets. One minor injury was reported to the firm, but it has not been confirmed and is under investigation. The recall includes both two-slice and four-slice Black & Decker® brand VersaToast™ wide-slot toasters. "BLACK & DECKER®," "VersaToast™" and "WIDE SLOT" are written on the side of the toaster near the cooking controls. The toasters have either white or black plastic enclosures. 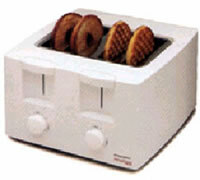 They have model number T1200, T1250, T1400 or T1450 written on the bottom of the toaster. For more information, consumers can call Applica Consumer Products Inc. toll-free at (866) 264-9230 anytime, or go to the firm's web site at www.householdproductsinc.com.